Sports organizations looking for new ways to drive merchandise sales should benchmark a recent tactic that major retailers across the nation are adopting. Realizing the success of the Groupon model, Walmart and other retailers are launching special offers that are determined by the number of "likes" they receive via social media. Walmart recently unveiled a Crowdsaver app on their Facebook page that unlocks a discount price when enough consumers opt in to "like" a product. The promotional offer encourages consumers to share the deal with their friends, family, and colleagues, in an effort to eventually benefit from purchasing said product at a lower price if enough people "like" it. 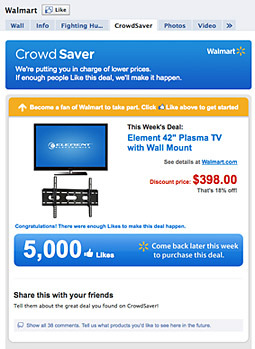 Walmart tested the promotional pricing model by offering a $500 plasma television at a discount rate of 18% if 5,000 consumers "liked" the product on Facebook and the company received an overwhelming response in less than 24 hours. Sports organizations can consider creating a similar application/pricing model on their Facebook pages and team websites to drive merchandise sales, ticket sales (if they are in control of inventory), and concessions items. While the model would need to be tested, teams could offer "Deals of the Day" and "Deals of the Week" and where fans can purchase apparel and other merchandise items at a discount price if "X" number of people "like" the item. This promotional model could serve as a great way to drive repeat traffic to social media sites, new interest in apparel and promotional items, drive group ticket sales, and provide new means of value for consumers. Consider implementing a similar "If the deal gets enough likes, the price drops for everyone" model within your organization!